Ok fine. Red Dead Redemption 2 is a technical success, but it continues to bother me how flat this story is. Not just this one - we're spoiled for beautiful games with lame stories. I'm going to pick on RDR2 because it's a clear example, and I think they're doing this on purpose. What's driving this guy - what does Arthur seek? It turns out he is remarkably unambitious. Our desire to see Arthur succeed is thwarted by the fact he's just fine. Imagine just how much we might improve this story by working his horse ranch for a chapter, then have it stolen. We need to be made curious, to become invested in something. 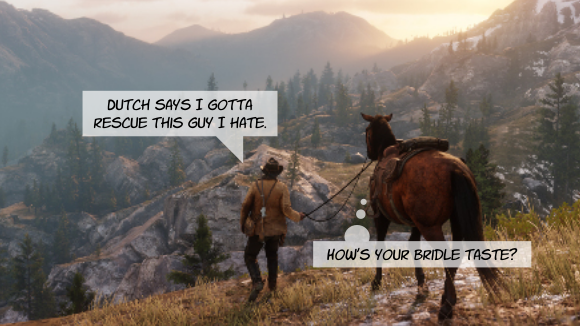 RDR2 thinks you should hear about Dutch. What obstacle is preventing him from achieving his goal? Nothing - there is no pressing threat. Imagine just how much better the story would be if the camera were to slowly pan to a bomb hidden underneath the camp - or a slowly approaching army. We must build tension like a python around Arthur. RDR2 is remarkably safe compared to other worlds. The most dangerous animal is the controller in your hands as you try to chord various Rockstar button sequences. You will crash your horse. Game companies don't hire famous aged authors. Looks like a dozen young teams made this. People should write what they know. It sounds rather ridiculous when young people try-on my middle-aged shoes. They don't realize this of course - perhaps imagine going back to read the serious concerns in your middle-school journal - now in the voice of the outlaw Arthur Morgan. Dozens and dozens of characters written by committee. I understand it takes a team to build a world this ambitious. They dissect the story and various people work on each piece, hoping it comes together in the end - a few things get cut because someone fails to deliver. What remains are a series of interesting, if unrelated scenes. I can't say for sure why lame story plagues these huge games. These problems have not hurt sales, so there is little incentive to fix it. Even the supposed "critics" have nothing critical to say. It's been getting worse as developers lean toward streamable content (whatever that is) and away from traditional stories. My ridiculous dream is that games develop stories solid enough to sell as stand-alone books, or license an existing book like the movies. This isn't Elon level difficult folks.